This video is going to be about the intensity of pulsed magnetic fields or PEMFs. There’s much information about intensity. Manufacturers make claims about their device intensities and say that their device intensities are the only ones that work. This is clearly untrue. I have worked with PEMF devices of all intensities, I’ve read thousands of research articles on the effectiveness of PEMFs for various health conditions. In fact, I’ve published a chapter in a scientific book on this the scientific term for it is dosimetry, this is the intensity of the stimulus, the amount of time, the volume of tissue being stimulated, and the desired outcome this is all based on two laws of physics. Faraday’s law and the inverse square rule PEMFs help the body by stimulating energy our charge of the tissues. Faraday’s law requires that the more charge needed for healing the higher the intensity that PEMF needs to be. Faraday’s law is a scientific term DB/DT where D is change B is intensity and T is time, this means the change in intensity over the change in time. the higher the intensity reached in the shortest time the higher the DB DT. the higher this value the greater the energy produced in the tissues some high intensity PDFs have DB DT s high enough to cause muscles to contract I have found them to be very effective. the other law is the inverse square rule magnetic field intensities drop off the farther the tissue being stimulated is from the source of the magnetic field so based on Faraday’s law intensities need to be high enough to generate enough charge to create change in the tissues. The amount of energy needed right next to an applicator may be much lower if the tissue is next to the applicator however if one is treating the entire lung heart or liver as examples, then clearly the higher magnetic field intensity levels are necessary to provide sufficient stimulation to the entire organ. some examples 2 inches from a 1,000 Gauss stimulator the magnetic field has dropped to around 20 Gauss this is a 98 percent drop in intensity but 20 Gauss is still clinically effective a 100 micro Tesla or one Gauss PEMF at 3 inches into the body drops to 1.2 micro Tesla a whopping 99 percent drop in intensity. So, there is little magnetic field left to generate charger to heal one review of the medical literature actually found that very low intensity PEMFs around 100 micro Tesla provide little benefit for a number of different chronic health conditions. 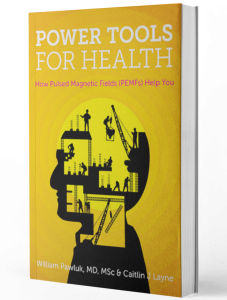 most research show a benefit for specific health conditions used magnetic fields greater than 30 to 50 goes much of this is covered in my soon-to-be released book power tools for health where I provide over 500 references for over 50 health conditions and topics on what intensities worked best. PEMF systems should be selected based on the unique needs of an individual intensities range from extremely low to low, medium, high and very high extremely low would be around 10 micro Tesla low would be between 1 and 10 dose medium would be between 10 and 100 Gauss high would be up to 4000 Gauss and extremely high would be MRI machines between 20,000 and 40,000 Gauss most clinical studies use intensities ranging from 10 to 1,000 Gauss in fact there are new recently FDA-approved PEMFs that treat depression and they’re also used for many other health conditions. They get up to around 4,000 Gauss or higher even. low intensity PEMFs need more and longer treatments. Medium to high intensity PEMFs can improve symptoms in less than a month with just minutes a day of treatment. I’ve seen a number of muscular problems disappear with just 2 to 3 hours of treatment using high-intensity PEMFs. Reality is people can’t spend a lot of time treating various parts of their bodies, that means that a whole-body magnetic system of sufficient intensity is usually equal to or greater than 30 Gauss does the job much more efficiently.